Use this vanity to bring more traditional style into your bathroom. With a white marble counter and white solid wood base, this product is good-looking and useful. Keep many bathroom items in its roomy drawers and double-door cabinet. This classic set from Wyndham Collection will make your bathroom look brand new. For a bit of traditional style in your bathroom, choose this beautiful vanity. Its white marble counter and white solid wood base are very easy on the eyes. Keep many bathroom items in its roomy drawers and double-door cabinet. Put a classic feel in your bathroom with this good-looking set from Wyndham Collection. For some added traditional style in your bathroom, choose this beautiful vanity. With a white marble counter and white solid wood base, this piece is very stylish. Made with a roomy double-door cabinet and drawers, this vanity has lots of room to keep items like toothpaste, towels, and hair brushes. Make your bathroom look like new with this good-looking, useful set from Wyndham Collection. Berkeley 60-inch W 5-Drawer 2-Door Freestanding Vanity in White With Marble Top in White Use this vanity to bring more traditional style into your bathroom. With a white marble counter and white solid wood base, this product is good-looking and useful. Keep many bathroom items in its roomy drawers and double-door cabinet. This classic set from Wyndham Collection will make your bathroom look brand new. 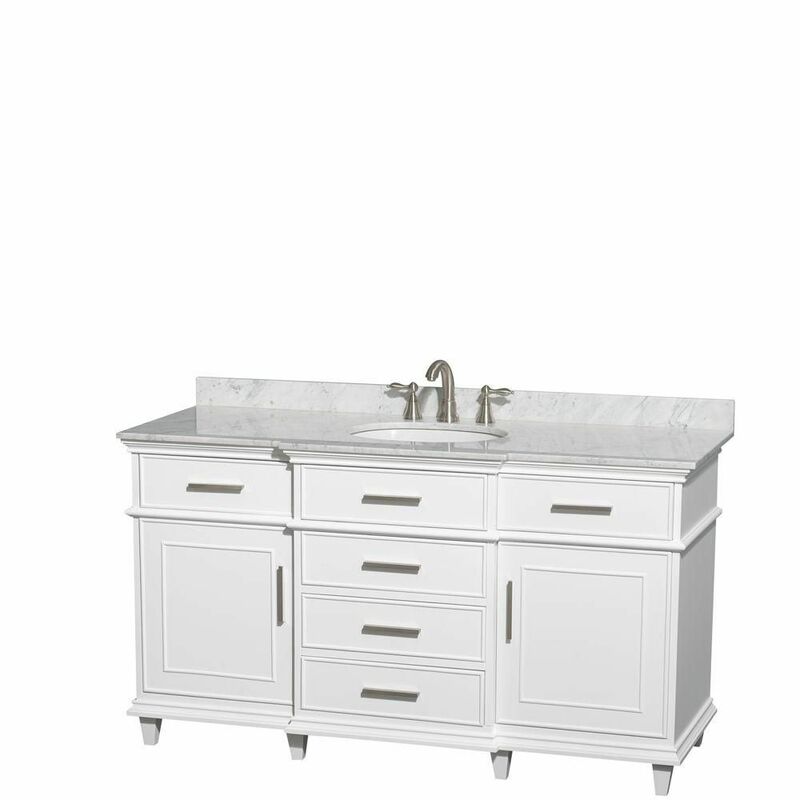 Berkeley 60-inch W 5-Drawer 2-Door Freestanding Vanity in White With Marble Top in White is rated 3.7 out of 5 by 3. Rated 5 out of 5 by Roberta from Marble top is just what I wanted Very pleased to have purchased this vanity. Wish you could see it. It is on a purple wall with all the other walls lilac. It really stands out. Love it. Rated 1 out of 5 by ShortStuff from This product is too tall. The counter top is nice but more gray than I expected. Thought the pl... This product is too tall. The counter top is nice but more gray than I expected. Thought the plumbing installation would be easier. You could not install the faucet while in place on the cabinet. Needed to install faucet and then place on cabinet. More difficult than I expected. We installed this bathroom vanity about one week ago. But the product is 3" taller than expected. I would not purchase this product again. Rated 5 out of 5 by Karen from Gorgeous pieces Looks very expensive.... Gorgeous pieces Looks very expensive.